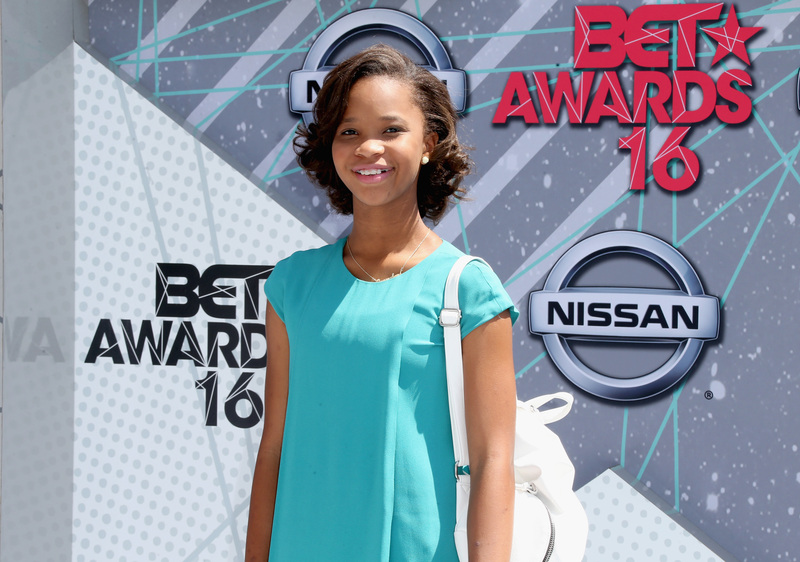 If you haven't yet seen Quvenzhané Wallis at the 2016 BET Awards, then you're in for a treat. The 12-year old star has already racked up an impressive list of accomplishments on both professional and sartorial fronts, and June 26's appearance didn't disappoint. Wallis was nominated for an Academy Award in 2013 for her role in the 2012 film, Beasts Of The Southern Wild, making her the youngest person ever to receive such a nomination. On the fashion front, Wallis was named the face of Armani Junior in 2014, making her the first major child celebrity to become the poster child of a luxury brand. The actor also has a four-book deal with Simon and Schuster, and appeared recently in Beyoncé's visual album Lemonade . Seriously, this girl is on fire. What Wallis' myriad accomplishments and killer style make clear is that we've only seen the beginning of what this young artist can do. The tween star arrived to the BETs in a pretty, turquoise, knee-length shift dress, and simple white accessories that show a chic sense of style. I love that she's chosen such a bright, cheerful hue, and that killer smile couldn't be brighter. It's hard not to be impressed with this girl's poise and fresh sensibility. Looks like Wallis is just beginning a long reign as youthful fashion queen. I can't wait to see what she does next.